All-night services are to run at weekends on most Tube lines, the London Overground and Docklands Light Railway. Weekend trains are due to start running 24-hours on the Piccadilly, Victoria, Central, Jubilee and Northern lines by the end of the year. Night-time services will be extended to the Metropolitan, Circle, District, and Hammersmith & City lines by 2021. Services will be extended on the London Overground in 2017 and the Docklands Light Railway by 2021. The plans are part of a six-point long term economic plan Chancellor George Osborne and London Mayor Boris Johnson said would add £6.4bn to the London economy by 2030 and create half a million new jobs. The government said it will provide £10bn of funding for investment in new London transport infrastructure over the next parliament, including new Tube improvements, better roads, more buses and cycle lanes, amid predictions the population of the capital is expected to reach 10 million by the early 2030s. The so called "night Tube" was announced in November 2013, with all-night services expected to run on Fridays and Saturdays on the Piccadilly, Victoria, Central, Jubilee and Northern lines from September. Tube services from central London currently finish at around 00:30 GMT on Friday and Saturday nights. Mr Osborne said: "We live in a 24-hour city, and the mayor is going to set out how our plan will deliver a 24-hour Tube operation to support it." 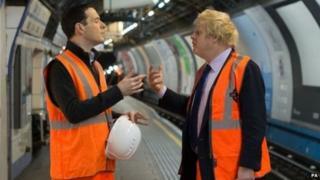 Image caption The chancellor and mayor outlined a six-point plan for what they called "a 24-hour London". Mr Johnson said: "As London's population continues to grow, it is investments in infrastructure such as this which will ensure that the capital remains competitive and the best big city to live in." Labour London Assembly member Tom Copley said: "With fares up more than 40% under Boris Johnson passengers rightly expect to see improvements but the fact is these plans won't come into effect until well after Boris Johnson and George Osborne have left power." Steve Hedley, senior assistant general secretary of the RMT, said the union was not opposed to the changes, but they did not want to compromise passenger safety. "We understand it is going to create jobs and it is going to help the economy, but we can't do that at the expense of the safety and comfort of our passengers and indeed our staff," he said. "We are all for the night Tube and we understand it's going to help the city but we do need adequate staffing and they need to stop this crazy proposal to close all the ticket offices." Mike Brown, managing director of London Underground, has previously said: "The new service will boost jobs and will benefit the economy by hundreds of millions of pounds." Transport for London (TfL) also confirmed it will extend wi-fi to all below ground sections of the Tube by the end of the next parliament. TfL announced it is ordering 200 more new Routemaster buses this year and committing to 800 new vehicles each year from 2016 onwards. London Underground: How does the Tube compare globally?